This week, in fact, as I write this blog, I’ve been sailing the high seas off Miami on a fact-finding mission to find out more on brand loyalty and great customer service. Well this week I’ve been onboard the Norwegian Pearl sailing four nights out of Miami with rock band KISS and 2400 or so devoted KISS fans. So here are some stats from the trip. USA makes up about half of the travellers, with Canada second, Brazil third and Australia fourth. The remaining 1300 or so are split almost evenly as second time Kruisers or all three Kruisers. KISS Kruise IV has been announced for same time next year. 1. The primary aim of this Kruise is to say “Thank You” to the fans. Time and time again Paul Stanley has said that these people are KISS’s loyalist fans. He said that the band can relax with these fans, and the set lists for the Sail Away unmasked concert and the two makeup concerts have been put together with input from Kruise passengers. And Stanley continually reminds the fans of their input, through each concert. Lesson Number 1: Listen to your customers. Take note. And give back. You can never over-reward your best customers. 2. KISS aren’t about the music. It is about moving product, mainly merchandise, for profit. Nearly everybody on board is wearing KISS gear. T-shirts, singlets, caps, bandanas, sloppy joes, tattoos, you name it. I bought three T-shirts to “remember the moment”, and I don’t even wear T-shirts!! The lines for the merchandise store have been huge. Long! Lesson Number Two: Know your profit centres and make sure you promote them. I even overheard drummer Eric Singer, out and about on the ship on Monday night, recommending to some travellers to head down to the merchandise store to pick up some specific products. 3. Be approachable to your customers. Monday night, after the Sunset Sail Away Concert had finished, I roamed around the ship familiarizing myself with its various features and facilities, before deciding to head down to a late dinner at the Sushi restaurant onboard around 9:00pm. So I sat down up at the Sushi bar, and there were only three other patrons eating…so I choose my seat next to one guy seated but chatting with some people walking out. So we chat for a while about watches, and I show him my new watch and he tries it on his own wrist. And because he’s a serious watch collector, he knows more about my special edition watch than I do!! I also pick his brains about drum kits for my son, who is very musical, and Eric offers some great advice. All up we chat for some fifteen minutes at least!! Lesson Number Three: Be there for your customers. I’ve heard of numerous sightings of Eric by other passengers during the three days at sea so far. And he’s really been out there being seen and meeting the fans! At the end of last night’s concert, after the other members of KISS had left the stage, Eric stayed on stage for about ten minutes handing out drumsticks to the audience. And specific people. So easy to do, yet so easy not to do. Can you imagine the goodwill that that ten minutes created, for those fortunate enough to receive a stick, and also for those who just witnessed that ten minutes, even for those fans too far back to have been anywhere near receiving a drumstick!! Really, Eric Singer could have just walked off with the others and that would have been that. As I quoted from Dan Kennedy at the start of this blog, it is those businesses that look outside their industry for best practices that they can borrow and adapt to their own business that are really gaining a distinct competitive advantage. These three lessons from KISS are great examples of simple and effective principles of business that are easily adapted to your Dental Office operations. In his book, No B.S. Ruthless Management of People and Profits, Dan Kennedy says that the number one imperative governing a business’s profits is having the most effective marketing, to attract new customers, to optimize the value of customers, and to rescue lost customers. And by marketing, he doesn’t just mean advertising. He means internal marketing as well. Like great staff members, and great systems. Because without a great team implementing great systems, there is no way on earth that you will make your business as profitable as it can be. And a business not running at full strength is like driving down the freeway with your foot on the accelerator but with the handbrake still fully activated. It’s very interesting when you break the dental business down into these three categories. Because most dentists don’t see their business as a component of two of these categories, let alone all three. Most dentists feel when things are slow, that they need to attract more new customers. And more new customers is good. But it’s not so good if your team and systems aren’t on board, and your business and practice is bleeding and leaking patients left right and centre through gaping holes in your procedures and protocols. Simple procedures and protocols that need to be followed by all team members at all times to make sure that clients, patients and customers stay in the dental practice forever, and spend more, and come more often and refer more people to you. But sadly, some team members don’t take an interest in the other parts of the dental office other than their own small world, and the task they have to do…. And it’s these team members who are found out time and time again when a Dental Office hires me to come in to their practice and implement the Ultimate Patient Experience Programme. It’s a real light bulb moment for some offices and some team members. You see, suddenly team members start to realise that their roles can be so much more than what they had originally thought they were. Great team members will embrace the change, the challenge and the responsibility involved in improving the dental office, and taking it up and over to a whole new and better level of service delivery. Sadly, at the other end of the spectrum, team members not willing to expand their horizons within the dental practice begin to find that they are indeed embracing new employment opportunities a lot sooner than they thought. And that can be a good thing for all involved, including those team members, and also the doctor, the other team members, the Dental Practice, and the patients of the practice. The team wins because embracing all three components of the business expands their roles and their education and their opportunity. It gives the team a power to really feel like they are contributing and making a difference, to the patients, to the practice and to the doctor and to each other. The patients win because they receive only the best of care and the best of treatment and the best of options and the best of services. The practice wins because the patients are committed raving fans, who visit more often, spend more per visit and refer more friends because of the wonderful service and experiences that they receive. The doctor wins because now he has a busier more productive dental office, filled with happy referring patients manned by a happy and engaged dental team. And the team wins again because of the process of unification and common purpose. You see, the processes of optimising the value of customers and of rescuing lost customers are not mutually exclusive. Because with increased optimization, with engagement of great Above and Beyond World Class Customer Service Principles, along with improved diagnosis and thorough and complete treatment planning and organisation, with all of this engagement there is a dramatic reduction in leakage and bleeding of patients and customers from the books of the Dental Office. And that means a dramatic reduction in the number of patients and customers requiring rescuing from the Ocean of Lost Customers. Bottom line is that all three services, when executed properly, and in unison, dramatically increase the profitability of the Dental Office. And that’s a Win-Win-Win for everybody and all. It’s a win for the Office, a win for the patients, a win for the doctor and a win for the team. And that’s what we’re all here working for. A lot more than just a paycheck…. The Ultimate Patient Experience is a simple to build system that I developed that allowed me to create an extraordinary dental office in an ordinary Sydney suburb. If you’d like to know more, ask me about my free special report. The Magic Number Most Dental Offices Are Not Measuring That You Need to Use to Create Massive Growth In Your Dental Office. There’s been a lot of talk this week about measuring and metrics and numbers that are used and needed in the dental office. But there’s one key number that I’ve used for years that a lot of dental offices either don’t measure or aren’t measuring that by its absence is stopping or inhibiting your dental office growth. “What gets repeated gets rewarded”…. So there’s some food for thought. On a daily basis, what numbers are you tracking and following in your dental office? Do you have daily goals? Daily Cancellation and Reschedule numbers? Daily lists of patients leaving without appointments? Do you have a daily production and collection target that you aim for and reach with consistency? And if you don’t reach your daily target, do you analyse why you don’t? On a daily basis you need to know what constitutes a good day, and a required day, and then you need to template your appointment book so that the mix of dentistry required to achieve that daily goal is easily scheduled, and not just haphazardly achieved. A week of well-balanced days of treatment is far more comfortable and far more satisfying for the team than a week with unbalanced days. For a doctor following numbers, for example, the number of units of crown and bridge being seated each day should be equal to the number of units being prepared each day. That’s a no brainer!! And the number of units being prepared each day is important in daily financial goals because those units go a long way towards making sure that your office reaches its desired numbers. I’ve written and blogged before about setting this goal based on dental office expenses and costs, as opposed to just winging it and hoping that you cover your office costs. Winging and hoping, and hoping that there’s some money over at the end of the month, at the end of the year, at the end of your life, is a sure fire way to lead a dissatisfied dental career. Once you have a daily goal, as I’ve mentioned in previous writings, you need to divide that goal to arrive at an hourly goal, and then apportion your clinical time proportionally, keeping in mind that required per hour rate. Because loss of focus on that hourly rate will see your dental office spiral away into the poor house, as your costs and expenses move in one direction while your collections move in the opposite direction. Once you know your daily production goal, then the crucial number that you need to be measuring that most dental offices *ARE NOT* measuring is the amount of treatment diagnosed on a daily basis. It is absolutely imperative that you know and are achieving the amount of treatment that you need to be seeing in your patients’ mouths, because this treatment needs to be appointed and scheduled to replace the treatment that you are completing each day. 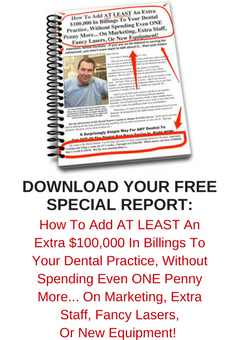 Because if your daily production of dentistry is $10,000.00 per day, as mine was, then you need to at least be diagnosing and scheduling that same amount of new dentistry each day as well. Otherwise, you’ll be out of business, Chapter Eleven, if you don’t. Period. So your office needs to be recording, on a daily per person per patient basis, the amount of dental treatment each patient that is seen is needing. Then, on a daily basis, we can break it down as to prioritizing and following up and appointing all of those patients with this diagnosed treatment. Because, as clinicians, that is our responsibility to our patients. It is our responsibility to our dental patients to make sure that all our patients receive the dentistry that is needed to make sure they have a disease free mouth that functions to its best ability. Having patients roaming the streets with unhealthy mouths is tantamount to medical negligence. Now, for one reason or another, not every patient will complete every piece of diagnosed dentistry that we see in their mouths. And it’s from this that we then establish our case acceptance rate or percentage. And it’s important to be mindful of this ratio, obviously, for a couple of reasons. This ratio affects the amount of incomplete dentistry sitting in your filing cabinets. So if you’re not diagnosing much, then there’s a good chance that your ratio is one hundred percent or close to it, because there’s more chance your patients are accepting the very little amount of dentistry that you bother to present. So the ratio is important to know, for your office. In my dental office we used to like to know that at the end of each day we had diagnosed and presented treatment to the patients in an amount equal to or higher than our daily production target which we had completed for those patients. In short terms that meant that treatment done walking out the door was being replaced with treatment needed walking in the door. And that’s just a principle of retail. Because you can’t just hope that the work is there. You have to measure it. And you have to manage it. From this, the really successful dental offices that I see as I travel the world have dental hygienists and therapists who are co-diagnosing significant amounts of dental treatment in their hygiene rooms with their doctors. And doesn’t that make sense? You see the dentist is already diagnosing treatment in his operatories…. He’s doing emergency endos, fixing broken teeth and presenting TMJ and cosmetic treatment down there. Because along the way, he’s got to stop some presenting and start doing some producing. Because while he’s presenting, he ain’t producing. And while he’s producing, he ain’t presenting…. So knowing that he’s got a focused hygiene department that is productively co-diagnosing and closing dental treatment before the dentist comes to complete the exam is a huge weight off the shoulders of the doctor. And why shouldn’t it be that way? We’ve discussed this before. In previous blogs. A dental hygienist is in a position of huge trust with the patient, and is working with them for a considerable amount of time prior to the doctor’s arrival to do the examination. And a dental hygienist knows good dentistry from bad dentistry, and they know disease from health. And they know broken teeth from not broken teeth. So why shouldn’t they help the doctor by providing a thorough co-diagnosis? You see, the dental office s that I see that are powering through the GFC, recession and depression are doing so because they have a committed team and crew that are mindful of their daily “diagnosed and presented treatment” number. Knowing and measuring the correct dental metrics is just one of the important modules that I teach alongside The Ultimate Patient Experience. The Ultimate Patient Experience is a simple easy to implement system I developed that allowed me to build an extraordinary dental office in an ordinary Sydney suburb. If you’d like to know more, ask me about my free special report. Sometimes Being a Great Restaurant Isn’t Only About The Food. Similarly, being a Great Dental Office Isn’t Only about the Dentistry. A great restaurant experience is all about the *Experience*. It’s about the atmosphere, the ambience, the wait staff, the efficiency, the courtesy, the friendliness, the delivery. And it’s also about the food. But it’s not *just* about the food. Last night I dined out with friends at the best restaurant in the district. Outside of Sydney, down near our farm. Well it was rated the best. After all, it had two “Chef’s Hats” in the recently released edition of the Sydney Morning Herald Good Food Guide, the Sydney Foodies’ Bible, so to speak. And it was difficult to book for. Which means it was popular. I booked something like four weeks in advance for a Saturday night sitting for four. My wife and I arrived twenty-five minutes prior to our 8:30pm booking. We were early. We knew it. And we were told our table was still being prepared. So we were escorted toward the bar for some pre-dinner drinks. However, the bar area was busy, so we were then ushered to a lounge away from the bar area to wait for our friends. A young waitress approached to offer us a choice of waters? We chose to delay that choice, and ordered a couple of Gin and Tonics with lime. Our friends arrived promptly at 8:30 and joined us on the lounge. After going and fetching their own drinks from the bar. However, at five minutes before nine, and with no communication whatsoever from any restaurant staff, I decided to chase up the maître de to see whether we could be seated for dinner. Now you must remember that this is not Sydney, but rural NSW, where dining out late is not really the norm. And my friends, who are locals, remarked that they recognised no familiar faces in the restaurant, indicating that the diners were more out of towners. Our waiter, Stephen, was very pleasant and efficient, but seemed handcuffed by protocols. On seating, our menus were presented. And surprise surprise! A choice of five or seven courses of degustation??? Now this would have been nice information to have been told at the time of booking, or at the time during the confirmation phone call on the day before??? You see by choice, my wife and I choose not to eat certain foods. So we can be awkward diners, in some cases. A third dining option was a three-course meal from a third page of listed courses. Now, at 930pm a three courses meal only was not going to cut it. Period. And there wasn’t a sufficient number of non-meat dishes on the list to stretch to seven. So it seemed to take an eon for the decision to be reached by the restaurant to allow us to have five courses of our own choosing…. Sadly, the evening ended on a sour note when the maître de came to inform us of a 3.5% surcharge on American Express card usage. Now I’m used to being whacked for using Amex. And I’m OK with two percent, and sometimes more. In fact I’m just negotiating with Amex myself for an extra Merchant agreement. So I know their numbers. But 3.5%? Well I told the maître de my feelings. That this was just purely a sting. Nothing less. And he stood his ground. So I told him there would be no tip. So what are the lessons we can learn here that can be applied to dentistry and particularly to your own dental office? Firstly, let’s deal with the Credit Card Surcharge. My thoughts are if you are charging a high-ticket item, like fine dining or dentistry, then just incorporate the credit card fee into your price or fee. End of story. There is zero benefit in showing and declaring it as an add on. None. Nil. Zip. A twelve dollar surcharge on a $390.00 meal? Talk about looking petty. And I guess the same goes for retailers of low-ticket items…how mean and stingy do you really want to look to your clients and customers? Secondly, know your time and run to time. When the booking is for 8:30pm, be ready for us at 8:30pm. If the table isn’t ready, then please inform me and let me know. Same in dentistry. If the doctor is running behind, let the next patient know there is a delay. Offer your patients a tea or a water to refresh while they wait. If I turn up early, thank me for coming early, and pander to me. This restaurant was just one customer service fail after another. We were not able to go to the bar, and then offered water rather than something stronger? And even that was served up wrong. For restaurants, pre-dinner drinks are free money…it’s extra on the bill. This place did not make us feel wanted at all. You see, it’s all about knowing your customer. Imagine in dentistry if you gave every new patient a sixty minute crown appointment? “Well that’s how we do it here! !” doesn’t really work, does it? In dentistry, a few preliminary questions to the caller will allow them to be booked with the appropriate dentist or hygienist, and also for the appropriate amount of time as well. This restaurant knew nothing about me before I arrived. Make sure in dentistry you have systems in place. This restaurant had no service recovery systems at all, it seemed. There was very little flexibility with the menu and ingredients. Perhaps an a la carte menu as well may have been in order. I certainly struggled to be satisfied with my five portions. In dentistry, when we mess up, we need to have systems in place to create a needed wow for our customers. If we’re running behind time we make our waiting patients feel pampered and special. Nothing less. In the treatment room, if they need a special pillow or a blanket, we know that, and have it ready for them. We feed back with enquiring questions to make sure we’re adding to our patient’s experience, making sure we do our best to make each visit an *Ultimate* Patient Experience. Because in the end, that’s what our clients, customers and patients will judge us on. How we make them feel. Not how good is our food. Or how good are our restorative margins. Because, in the end, it’s all about “Make me feel important”…. Developing Great Customer Service systems, is just one of the many benefits of using the straight forward and easy to implement modules that make up The Ultimate Patient Experience, a simple to build system in itself that I developed that allowed me to create an extraordinary dental office in an ordinary Sydney suburb. If you’d like to know more, ask me about my free special report. One Bad Apple Spoils the Barrel…. One of the things that I find and see as I meet with dentists and their teams around the world is that there are dental offices out there where not all members of the team are on the same page. “On the same page” means the team all has the same agenda at the same time. In business, and in sporting teams, if the entire team is not all focused together on the common goals and outcomes then the outcomes are achieved with duress, if achieved at all. You’ve heard the idiom “A chain is only as strong as it’s weakest link”? It’s a truism that can be applied universally to sporting teams as well as businesses. If the defensive line has a vulnerable player in it, then it doesn’t matter how good the rest of the players are, the opposition will direct their attention toward this weak player, as this will be their easiest place to penetrate the defensive line. Similarly in business, if one business team member or employee is not performing to the requirements of their role, then the business will suffer, because the weakness will become a vulnerability in the process of doing business. In dentistry, this can be as simple as having an inexperienced or not fully trained person performing a role where experience and developed skills are required. I see this so often where a team member from the clinical team is “thrown onto the front desk” to answer the phone and deal face to face with patients and customers, yet has not been trained, or has not developed the necessary skills and nuances required to perform this role to the necessary level. I see dental offices that wear this sort of transition as being acceptable and normal in the process of running a business. To the contrary, accession of roles within the dental office should be planned for, as a normal part of business. Front office skills and phone answering should be taught to and trained for all team members, so that when there is a need for one team member to step up to the plate, so to speak, then they are ready, and the business is ready, for their performance of this role. Because think about it. Why should your customers play lucky dip with who they get when they call or do business with your office? Why should your clients ever have to deal with someone who is undertrained and a weak link, but yet be expected to pay full and regular price for that service or process? It just wouldn’t be fair? You wouldn’t expect to be served at a fine dining restaurant by a wait staff “thrown into” the role under trained? Nor would you feel safe knowing that your car was serviced by the car washer, because the regular auto-mechanic was not available at your auto shop? In the same way that lack of skill and training and preparation can be a vulnerability to a sporting team or business, then the same can be true, and is true for someone in the team displaying less than the desired character traits and motivations necessary to perform at the required level. When the team knows that there is a weak person, or a bad apple, who has penetrated into the business, into the team, it sure weighs heavily upon the other team members. It’s a punishment to the other team members that just does not need to be present. We’ve seen it in sport. A player with a bad attitude to training will have and be a disruptive influence on the psyche of the rest of the team. We all know of sporting teams that have to let star players go because the player is not one hundred percent focused and dedicated to themselves and the tasks at hand, let alone to the goals and desires of the team. In the dental office this can be as simple as an employee that has a bad attitude, or an employee that always turns up late, or an employee that is constantly absent from the role they need to perform, due to illness or perceived illness. An injured or sickly dog is of no use to the dog sled team. Similarly, a football player whose mind is not on the job will soon find himself on the market and looking for another team. Everyone knows the story of “Lay Down Sally” who stopped rowing in the Athens Olympic Games, letting her oar drag and laying back, causing her team to finish last in the final. Her fellow rowers were inconsolable after this race. Nobody likes to play or work in a team with such vulnerability. It wears away at all team members. In the best interests of the business and the team the rotten fruit must be sorted and removed. For the betterment of everybody. Team members. Business. And customers. You can’t let one bad apple continue to spoil the barrel. You owe it to yourself, to your team, and to your customers to have the best trained and dedicated people in the appropriate positions in your office. Hiring correctly is just one of the modules taught in The Ultimate Patient Experience, a simple easy to implement system I developed that allowed me to build an extraordinary dental office in an ordinary Sydney suburb. If you’d like to know more, ask me about my free special report.